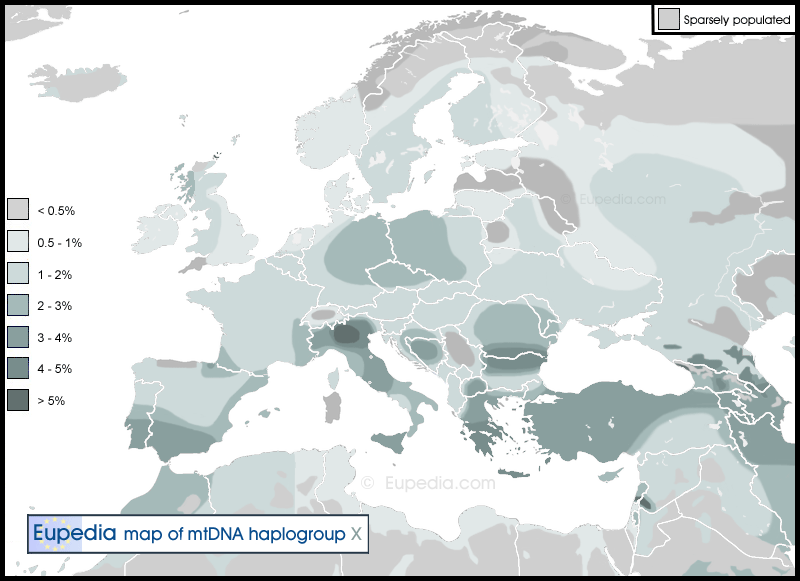 Haplogroup X is one of rarest matrilinear haplogroups in Europe, being found only is about 1% of the overall population. The highest incidence of haplogroup X is observed in Greece (4%), Macedonia (3%), Romania (2.5%) and around the Caucasus, notably among the Avars (5%), Adyghe-Kabardin (5%), Karachay-Balkars (4.5%), Nogays (4%), Dargins (3.5%), Armenians (3.5%), Azeri (3.5%), North Ossetians (3%) and Georgians (3%). In Western Europe, X peaks in Orkney (7%), Scotland (2.5%), Catalonia (2.5%) and the Basque country (2.5%). The only Eurasian ethnic group possessing a relatively high percentage of haplogroup X are the Druzes of Lebanon, Syria and Israel, among whom X makes up 15% of maternal lineages. The Druzes also have the greatest diversity of X lineages of any population, possessing X1a, X1c, X2b, X2e, X2f, X2h and X3 lineages. Non-Druze populations in the Levant have far lower frequencies of X, between 1% and 2% only. Haplogroup X is completely absent from the Volga-Ural region and Lapland, in the extreme east and north of Europe, respectively. The X2a subclade is also found among many indigenous Amerindian people from North America, notably among the Sioux (15%), the Nuu-Chah-Nulth (11%–13%), the Navajo (7%), and the Yakama (5%). The mutation defining haplogroup X is thought to have taken place during the late Upper Paleolithic, some time between 20,000 and 35,000 years ago, probably in West Asia. Haplogroup X has never been found among Mesolithic hunter-gatherers from Europe or North Africa. It first appears with the arrival of Near Eastern farmers during the Neolithic. The high diversity of X subclades in the Middle East and the Caucasus also support a Neolithic diffusion from this region. The oldest samples of haplogroup X identified to date are an X2d2, an X2m and an X2m2 tested by Mathieson et al. (2015) as part of the 26 Early Neolithic genomes sequenced from the Barcın site (6500-6200 BCE) in north-western Anatolia, and an Early Neolithic X2b from Thessaly in Greece tested by Hofmanová et al. (2015). Apart from one X1 sample from the Cardium Pottery culture in Spain, which could have come from North African herders, all Neolithic European samples tested to date belonged to X2. X2b and X2c appear to have been the most common subclades in Neolithic Europe. X2b has been found in Neolithic Greece and Hungary, in Linear Pottery (LBK)-related cultures (Schöningen, Salzmünde) in Germany, in the LBK-derived RRBP culture in the Parisian basin, as well as in Chalcolithic Portugal. X2c was found in LBK-related Baalberge and Rössen cultures in Germany and in Cardial Spain. X2d1 was also found in the LBK culture. Apart from that, many X2 samples with undetermined subclades have also been identified in the Starčevo culture in Hungary, the Cardium Pottery culture in southern France, and in Megalithic burials in the Basque country, Navarre and Brittany. Haplogroup X is one of the few West Eurasian haplogroups (along with N1 and N2, which include haplogroups I and W) that does not descend directly from haplogroup R (the ancestor of haplogroups HV, H, V, J, T, U and K), but directly from the older macro-haplogroup N, upstream of haplogroup R. These are known as 'Basal Eurasian' because they are closer to haplogroup N in the phylogenetic tree, which represents the Out-of-Africa migration of our ancestors 70,000 years ago. The Y-DNA (i.e. patrilinear) equivalent of mt-haplogroup R appears to be macro-haplogroup IJK, from which all modern Western Eurasian Y-DNA haplogroups are descended, except for the rarer haplogroups F, G and H. The Basal Eurasian haplogroups appear to have been the dominant paternal and maternal lineages linked with the diffusion of agriculture from the Fertile Crescent. The very first farmers of the Pre-Pottery Neolithic in the Near East, tested by Lazaridis et al. (2016) and Kılınç et al. (2016), belonged to mtDNA haplogroups N1a1a, K1a, J, T, R0a and X2, and to the Y-DNA haplogroups CT, E1b, G2, H2 and T. Early European farmers did not bring all of those lineages from the Near East. They carried especially Y-haplogroup G2a and H2 (both basal Eurasian) and mt-haplogroups N1a1a, K1a, J, T and X2. Nowadays, some isolated regions which have retained a higher incidence of Neolithic ancestry, such Greece and Georgia, have particularly high percentages of Y-DNA G2a and mtDNA X2. Haplogroups X1 and X3 are found mostly in the Levant, North Africa and parts of south-western European, which correspond fairly well to the distribution of Y-haplogroup G2b. In contrast, only the X2 branch and to Y-haplogroup G2a are found among Europeans, Anatolians, Caucasians and Altaians/Siberians. X2c and X2d are the main X subclades found in the northern half of Europe and happen to correlate with the distribution Y-haplogroup G2a3b. The only anomaly is the extremely low percentage of X in Sardinia (0.4%), which has a lot of G2a and harbours the modern population genetically closest to the Neolithic European farmers. This could have been caused by a founder effect in the small group of Neolithic farmers who settled in Sardinia, who by pure chance would have lacked mtDNA X. The 0.4% today could simply be the result of later migrations. X2d, X2e, X2n and X4 are all found in central Europe, around the Caucasus and in Central Asia, and could therefore have been spread at least partially by the Proto-Indo-European speakers during the Bronze Age. Tribes carrying Y-DNA haplogroup R1b are thought to have lived in eastern Anatolia and around the Caucasus for several millennia before migrating to the northwest Caucasus and the Pontic Steppe. They could thence have absorbed X lineages, which would later have been diffused across Europe and parts of Asia settled by the Indo-Europeans. Some of these subclades, notably X2d, would already have been present in Europe due to earlier migrations (Neolithic farmers) from Anatolia. X1c: found in the Levant (Druzes) and Tunisia. Isolated samples have been reported in Italy, Ireland and Norway. A study conducted by Maruszak et al. (2014) analysed the mtDNA of 395 elite Polish athletes (213 endurance athletes and 182 power athletes) and 413 sedentary controls and found that haplogroup X is among the most overrepresented mtDNA types among endurance athletes at the Olympic/World Class level. The Nancy Hanks Lincoln mtDNA Study traced back the mitochondrial DNA lineage of Abraham Lincoln (1809-1865). The testing of matrilineal relatives of Lincoln's mother, Nancy Hanks, provided evidence that the the 16th president of the United States belonged to the very rare haplogroup X1c.